Who's Behind The Mass Stabbing In China? : Parallels The government is accusing Muslim separatists, known as Uighurs, for the knife attacks that killed 29 at a train station. But the government hasn't provided hard evidence so far. People in the southwestern Chinese city of Kunming lined up 15 deep on Sunday night to donate blood for the more than 140 people who were injured in the mass knife attack at the city's rail station. The Chinese government has blamed the deadly stabbing attack in southwest China on Muslim separatists from the country's northwest, but it has yet to provide hard evidence for the claim. Police said they have captured the final three suspects in a knife attack that killed 29 people and left more than a 140 injured in the city of Kunming on Saturday, according to the state-run New China News Service. Police say they shot and killed four suspects and captured an injured female suspect at the Kunming Rail Station, the scene of the massacre. China's Ministry of Public Security said the eight-member gang was led by a man named Abdurehim Kurban. Xia Fanchao arrived at the station in Kunming, the capital of Yunnan province around 9 p.m. Saturday. He planned to catch a train toward the east coast, where he'd lined up a job installing elevators. As the skinny 18-year-old stood outside the entrance, he noticed something strange. "I saw a man carrying a bag, which he dropped on the floor of the square," said Xia, who spoke from his bed at the Kunming No. 1 People's Hospital. "Quite a few people rushed to the bag and unzipped it. Each took out a knife and then split up among the crowd and started to slash people." Xia says the assailants, all clad in black, moved about the square without speaking. They slashed at people as though "they were chopping firewood." Xia said some of the knives were 20 inches long. A woman in a long black dress and a black veil ran toward Xia. "She lifted the knife and was about to slash me," he said. "I dodged and it cut my neck. It felt like I was being electrocuted." Chinese officials say they have evidence the massacre was the work of Uighur separatists. A Chinese Foreign Ministry spokesman said Monday that police found flags used by an outlawed separatist group from Xinjiang at the station after the attacks. The Uighurs are a Muslim, Turkic-speaking people. There are about 9 million of them in China and they are concentrated in the northwest Xinjiang region. Uighur groups have deplored the massacre. World Uyghur Congress spokesman Dilxat Raxit said in a statement to Radio Free Asia that there was "no justification for attacks on civilians," but added that repressive policies provoked "extreme measures." "We've never seen anything quite like this," said Dru Gladney, a professor of anthropology at Pomona College in California, who has studied Uighurs for three decades. "This would mark an extreme escalation of the kinds of incidents we've seen in the past." Gladney said Uighurs have various complaints about Chinese rule, including lack of access to jobs and educational opportunities. But past attacks have generally focused on government offices or police stations in Xinjiang — symbols of official power. Gladney said the slaughter of civilians in a city more than a thousand miles away, such as Kunming, is new. "This may have been motivated by Islamic extremism, especially if they're dressed all in black, and especially if the woman was in a veil, a black veil," Gladney says. "Uighur women rarely wear that." "Uighurs have not generally been susceptible to jihadi or Islamist extremism," Gladney continued. "This is quite disturbing." Zheng Jianguo, a warehouse manager from eastern China, witnessed the attack at the railway station. When he saw an assailant clad in black, he thought militant Islamists must be behind the violence. "It looked like the outfit of a black widow," said Zheng, referring to Islamist female suicide bombers from Chechnya, who have worn similar clothing. Zheng came to Yunnan on a photo safari with fellow hobbyists from the northern port city of Tianjin. 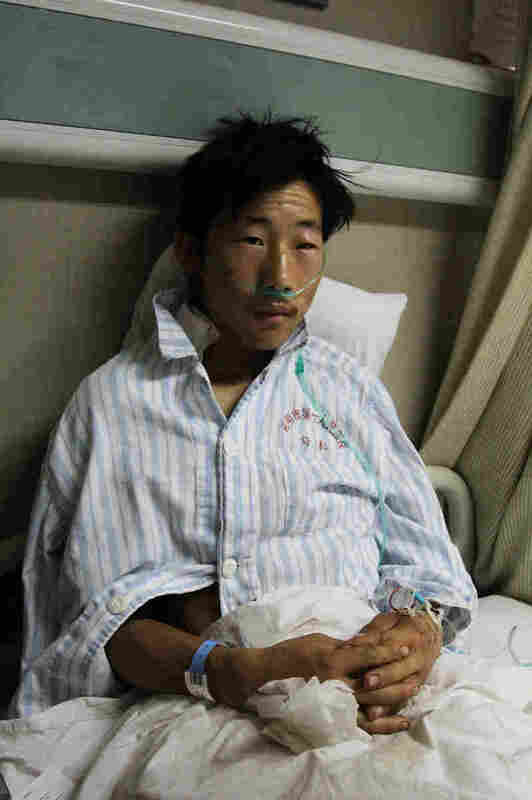 He was at the hospital Monday, visiting a fellow tour group member, Zhuge Ruichao, who was wounded in the attack. A doctor daubed the sutured gashes on Zhuge's scalp and rewrapped his head in gauze. Zhuge says he, too, was attacked by a person in a long black dress and matching veil. "When the attacker stabbed my mouth, I felt the pain and unconsciously clenched my teeth," said Zhuge, whose mouth took more than 20 stitches. "I grabbed the dagger from the person's hands and stabbed back once, I don't know where exactly." 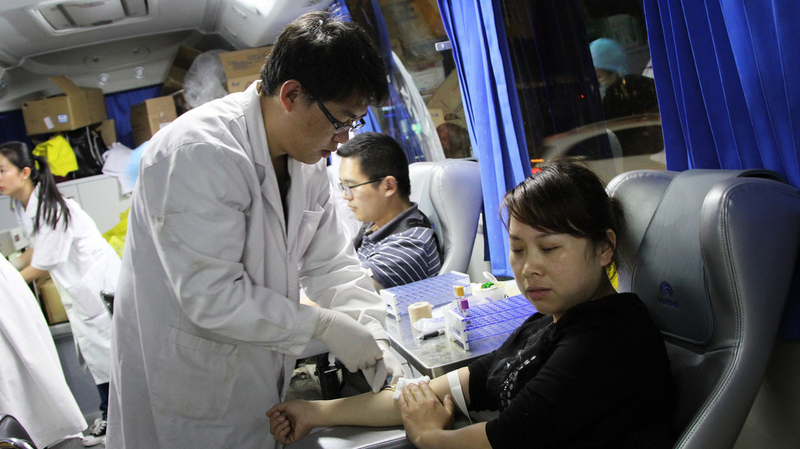 Ian He, an engineering student, spent part of Sunday night donating at a mobile blood bank for victims. As he stood in a line 15 deep, he pondered a few of the unanswered questions surrounding the massacre. He said he thinks Kunming, which is nicknamed Spring City because of its climate, was chosen for the attack because it was a soft target. "They cannot fight face-to-face against armed forces, so they came to a remote city to carry out the attack," said He, who wore a gray hoodie, jeans and a baseball cap. As to why the attackers used knives, instead of guns – which are illegal, but accessible - He thought it was for effect. "We feel guns are not that scary," he said. "Their goal is to create chaos and terror. In fact, knives are more terrorizing."